We started small, and early. Job Seeker began as a noticeboard on the Infoxchange website way back in 1996 – that’s before most households even had the internet! Then we got bigger. With recruitment being a constant in the community sector, Job Seeker was established as a standalone site in 2006. Being a not-for-profit, our goal was to provide not only a quality advertising space for the sector but also a way of giving back by using our revenue to fund impactful programs in the community. Over the last 10 years, we have advertised over 30 000 vacancies – potentially saving the sector up to $6 million by keeping advertising costs well below other job sites*. Through funding from Job Seeker, our parent organisation Infoxchange has also been able to deliver ground-breaking initiatives like Go Digi and Youth IT Careers. 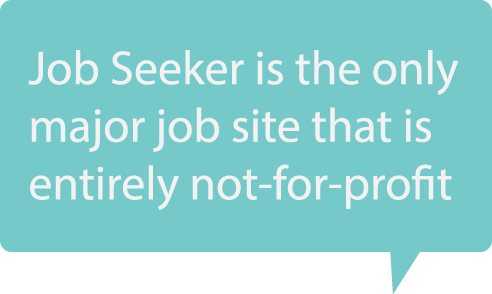 We want Job Seeker to be the go-to place to advertise not-for-profit or community jobs all across Australia, and we're committed to making sure you continue to receive quality candidates. Being the only major job site that is entirely not-for-profit, we also want to increase our contribution back into the community. For example, we're passionate about Infoxchange's Youth It Careers program which helps open doors to young people looking for work - and we believe helping disadvantaged youths with their job seeking journey helps us with ours. The bigger we get, the more we can keep the costs low for the sector by offering a stable alternative to expensive commercial advertising. Maintaining a dedicated job board for the community sector also means as recruiters you get to see more candidates with the right experience and less resume overload offered by the big job boards. We need the sector to work together! The more we build up Job Seeker, the less the community sector will need to rely on expensive, ineffective job sites to fill their positions. So tell your managers, colleagues, contacts, friends and relatives about Job Seeker and let's make it easier than ever for people to find a job that matters. Have some ideas on what we can do better, or want to help us spread the word? Get in touch!